Israel is protecting Europe from terror. 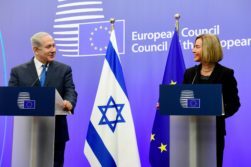 PM Netanyahu and EU Foreign Minister Federica Mogherini. Illustrative. Photo courtesy of: Avi Ohayon (GPO). The same week that the IDF has had to confront Hamas terrorism from the Gaza Strip, Israel made multiple quieter headlines in their fight against the side of terrorism that isn’t quite as obvious, but ultimately just as dangerous. Fundraising and recruiting—those indirect elements that fuel terrorist organizations—received Israel’s focus as Hamas’ television station was designated a terrorist organization in its own right and Israeli diplomacy sought to cut off more terror dollars. On Wednesday, Israeli Prime Minister Benjamin Netanyahu signed an order that deems “Al Aqsa” television as a terrorist entity, following an investigation by the Israel Security Agency (ISA) that found the station was being used by Hamas to recruit militants. 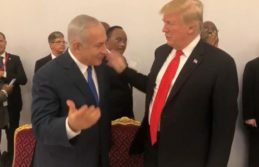 A press release from Netanyahu’s office said that the move was recommended by the ISA and the Israeli Defense Ministry national anti-economic terrorism unit. The United Kingdom last week decided to define all of the Hezbollah group in Lebanon as a terrorist organization, with penalties for being a member of the entity, and thereby ceased differentiating between the so-called “political” and “military” wings of Hezbollah. On Sunday, Israeli Prime Minister Netanyahu called his British counterpart Theresa May and thanked her for the move, and added that “he expects additional countries to follow suit,” according to a press release from his office. 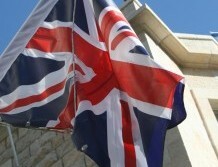 The decision, summarized in a news report on the UK government website, said that the order would make membership in or support of Hezbollah a criminal offense. While the “military” wing of Hezbollah has been proscribed as a terror group in the past, the latest decision includes the “political” side of Hezbollah as well. After the shooting attack at the Tree of Life – Or L’Simcha Synagogue in Pittsburgh last year, a key Israeli organization wanted to show that the Jewish State felt connected to the victims in the United States by setting up a memorial. 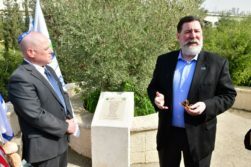 On Sunday, Pittsburgh Mayor Bill Peduto returned the sentiment by visiting the memorial during his time in Israel for the International Mayor’s Conference. 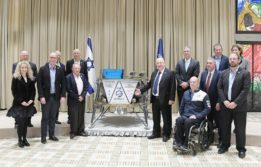 Israel is set to become just the fourth country to land a spacecraft on the moon, as the satellite “Beresheet”—Hebrew for “Beginning”—is scheduled to launch atop a SpaceX rocket around the end of this week with its destination being the lunar surface. The spacecraft will carry a time capsule to be left on the moon—which includes a digital Bible, Israeli national symbols and Israeli songs—as well as conduct an experiment to measure and map the moon’s magnetic field, per Israeli press releases. The lander is scheduled to touch down on the moon in April. Attacking Israelis won’t pay as easily now. 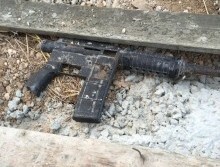 Illegal gun seized by Israel. Illustrative. Photo courtesy of ISA. Financially supporting terrorists is going to cost double for the Palestinians, as Israel on Sunday froze over 500 million shekels (roughly $139 million) in tax monies owed to the Palestinian Authority (PA)—which mirrored the exact amount the PA paid to terrorists and their families in 2018. The move follows passage of a law by Israel’s government in July 2018 authorizing the financial seizure, according to a press release from the Israeli Prime Minister’s Office. The Palestinians are boycotting a conference on peace and security in the Middle East set to be co-hosted by United States and Poland this week, while Israeli Prime Minister Benjamin Netanyahu already has plans for his focus at the event. But the key official’s agenda for the conference is White House advisor Jared Kushner, who reportedly plans to talk about US President Donald Trump’s too-be-announced Middle East peace plan.